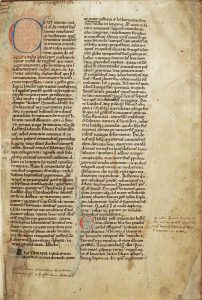 A lot has been written and said about the contribution of the Beowulf volume to Old English scholarship and on the ways Tolkien thought about the English Arthurian tradition as evidenced in The Fall of Arthur, but what I want to focus on today is what is it that linked those two works in Tolkien’s imagination as represented in his Middle-earth mythology. Carpenter seems to be pointing to Malory’s Morte D’Arthur as an immediate source for Tolkien’s poem. However, Tolkien’s poem was written in alliterative metre, while Malory’s is in prose. At that time I had very little to go on: just Carpenter’s description of The Fall of Arthur[v] and those 45 or so lines in the Bodleian (in pretty undecipherable handwriting), but Tolkien’s love and desire for a modern revival of alliterative poetry had been long known (not least from his published work – especially in The Lord of the Rings) and, of course, much has been written and discussed about Tolkien’s Francophobia; and Tolkien as a writer of Englishness, interested in an English mythology and identity, as opposed to “things Celtic”. I suppose I got some things right – which brought a great feeling of relief when I finally read The Fall of Arthur in its entirety: the Alliterative Morte Arthure is indeed the most substantial source for Tolkien’s unfinished poem, and Christopher Tolkien’s commentary seems to support the idea that Tolkien had in mind the English “chronicle” tradition of King Arthur, rather than the French “Romance” tradition, or the Arthurian folklore tradition from the Welsh material. But, then, I really didn’t expect that Tolkien was contemplating linking The Fall of Arthur with his own legendarium. This was a complete surprise, which opened entirely new questions and research avenues. What was Arthur doing in the East at the beginning of The Fall of Arthur? Where (and what) is Avalon? I will address the latter first. Arthur dying in the gloom. Robbers search the field. [Excalibur >] Caliburn and the lake. The dark ship comes up the river. Arthur placed upon it. In the extraordinary draft poem that follows, which Christopher Tolkien calls, for convenience, “Eärendel’s Quest” (it seems to be the “Eärendel passage” Tolkien refers to in the last but one quotation), Eärendel seems to take the place of Lancelot (or vice versa?). by the sounding sea, where the sun westers. her gold in silence unseen gleameth. of Lancelot and his lady. under moon or sun who in ………..
of the Bay of Avalon on the borders of the world. up[on] Earth’s border in Avalon [sleeping >] biding. Now this ambiguous idea of Arthur mortally wounded, on the one hand, but carried over to Avalon over the sea to be healed, on the other, goes back to Geoffrey of Monmouth’s Historia Regum Britanniae, the beginning of the Arthurian legend as we know it today, where we hear very briefly that he was “carried thence to the isle of Avalon [insulam Auallonis] to be cured of his wounds”[x]. In his later work, Vita Merlini, Geoffrey elaborates on Avalon, and translates its name: he refers to it as the “Island of Apples, which is called the Fortunate Isle” [insula pomorum que fortunata vocatur]. Most scholars agree that the derivation of the place-name “Avalon” confirms Geoffrey’s translation: in Welsh afal means ‘apple’, so the term “Avalon” and its otherwordly associations point to a Welsh tradition. A cognate and parallel mythological use is attested in early Irish literature: Emain Ablach, ‘Emain of the apples’, is the poetic name for the Isle of Man when it is specifically identified as the blessed and otherworldly domain of the sea divinity Manannán mac Lir. Though there are much more numerous in Irish medieval literature, there are examples of otherworld islands in the Welsh tradition, e.g. the timeless feast in the island of Gwales in the Second Branch of the Mabinogi. But, most importantly, Arthur himself is involved in an expedition to an otherworld island in the early Welsh poem ‘Preiddeu Annwn’ (‘The Spoils of Annwfn’, c.850-1150). He leads a sea raid on an otherworldly stronghold made of glass in his ship, Prydwen. The aim is to rescue a prisoner and steal a magical cauldron that ‘does not boil the food of a coward’. But the tradition that Tolkien seems to be alluding to in his draft, is Arthur’s departure to Avalon and his promised return, a Messianic prophecy that gave the Anglo-Saxons and Normans a lot of headaches when they were faced with Welsh nationalism. In Vita Merlini Geoffrey includes this belief in Arthur’s return. But the belief seems to be earlier, part of the Welsh, pre-Galfridian Arthurian tradition. The first hint of this tradition in the Welsh medieval corpus is a text that Tolkien definitely knew, and that – I think – he emulates in his projected ending of The Fall of Arthur: the Englynion y Beddau (the Stanzas of the Graves). 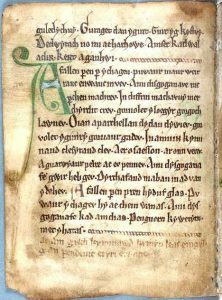 This is series of verses in the manuscript known as The Black Book of Carmarthen which list the locations of the graves of famous Welsh heroes. To my knowledge, there is no other medieval work that lists the graves of Arthurian heroes in the way Tolkien does, other than the Englynion y Beddau. 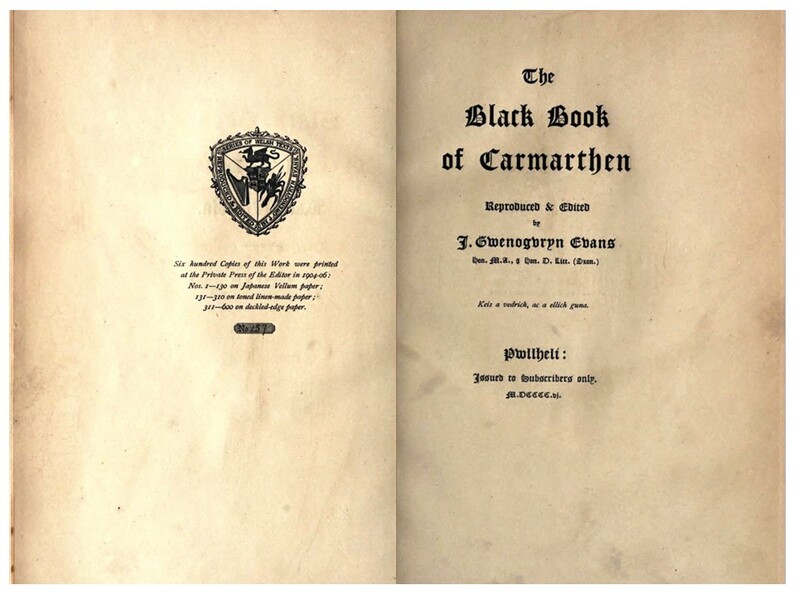 Tolkien actually owned two copies of this text: one in a 1888 facsimile and one in a 1907 edition and reproduction of the Black Book of Carmarthen. 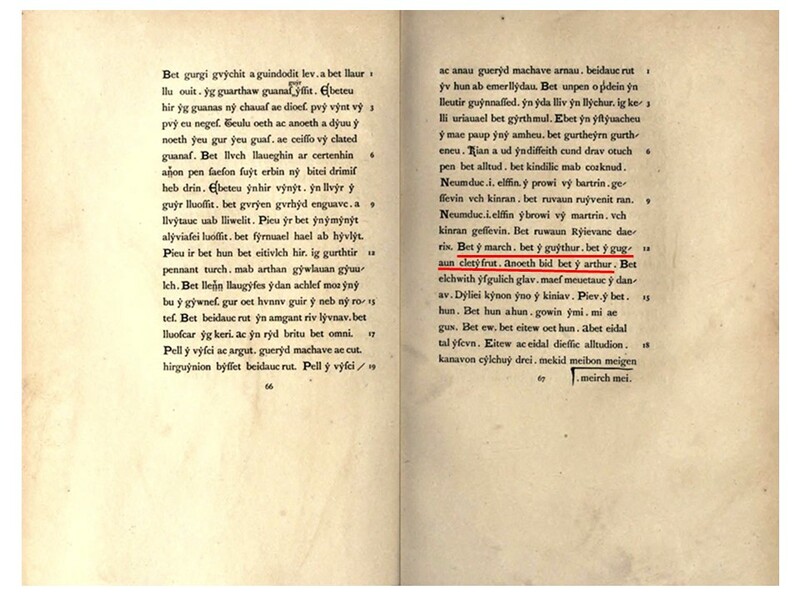 You can see the latter (in the exact edition Tolkien owned) in Image 1, and the pages containing the verses quoted above in Image 2. So much for the Arthur of the English, then! As I was reading The Fall of Arthur, I was definitely getting elements of motifs and tone from the Alliterative Morte Arthure (the strong homosocial bonds between Arthur and his knights, for example; or the insistence on the epic/chronicle depiction of Arthur as an active war leader, rather than the more shadowy Arthur of the Romances); but I was also getting bits and pieces of the Arthur of the Welsh. In Tolkien’s work, Arthur’s ship is Prydwen, a name attested in the Welsh tradition only (Geoffrey had evidently heard it but got it wrong, as he gives the name Pridwen to Arthur’s shield). Wales also figures as a location in the poem with somewhat mystical associations: twice Tolkien describes Wales in his poem as “the hidden kingdom” (Canto IV, lines 12, 67). There are many “hidden kingdoms” of the Elves in the legendarium, including Gondolin and Nargothrond, but the term Hidden Kingdom, capitalised, usually refers to Doriath, which – as I hypothesized in my 2007 article – is associated with tales for which Tolkien was inspired by “Celtic” material. But what is more significant, is that – by the point of the projected ending of Tolkien’s poem – the Welsh-derived tradition of Arthur as the “once and future king” seems to have prevailed. And I think it is significant that the MS of the Alliterative Morte Arthure seems to echo exactly what Tolkien did: As I said before, this 14th-century poem ends with Arthur’s elaborate funeral and burial at Glastonbury. But added to the very end of the poem, in a different hand from that of the main MS scribe, is the line: “Hic jacet Arthurus, rex quondam rexque futurus.” (Here lies Arthur, king once and king to be.) Scholars have debated this addition, claiming that it clashes with the scene of Arthur’s funeral just a few lines above. Is this added line a reference to Arthur’s importance even after death? Is it Arthur’s supposed epitaph? Or is it – as Mary Hamel has claimed – that the writer simply ‘disagreed with the poet’s ending’[xiii]? I think that Tolkien’s interpretation would be the latter – or at least, he himself disagreed with this ending and went back to the older Welsh tradition, to Avalon and the absence of a grave for Arthur. But why link this tradition with his own legendarium? Why make the Arthurian Avalon equivalent to Tol Eressea, the island of the Elves off Valinor? In the notes that accompany the texts of The Fall of Arthur, Christopher Tolkien gives a full commentary of the emergence of the name Avallon in Tolkien’s mythology. In the legendarium, Avallon was also (initially) associated with Tol Eressea, but is there given as an alternative Elvish name for the island, in the mode of the linguistic punning that Tolkien often liked to use. The term first shows up in the legendarium with the emergence of Númenor and Tolkien’s unfinished novel The Lost Road around 1936-1937. Was that around the same time he was also contemplating the ending of The Fall of Arthur? Perhaps. Christopher Tolkien actually gives us a list of Tolkien’s plot notes for the ending of the poem (see Image 3) on which he writes down the date “Aug 1937” at the point where Arthur departs for Avalon, so there is corroboration for this hypothesis. What was the point of Arthur’s campaign in the East in The Fall of Arthur? and the tides of time turned against him. Now we’ve seen many times in Tolkien’s world this motif of sorrow and loss over a changing world that will never be the same again – most recognisably in The Lord of the Rings, but it is astounding that Tolkien here laments the end of the Romano-British world, and portrays that Anglo-Saxon invasion as a disaster. Christopher Tolkien’s commentary also notes this remarkable deviation from Tolkien’s usual sympathies, and – significantly – he links this sense of a world at the edge of doom with Tolkien’s other long alliterative poem on a semi-historical, semi-legendary event: The Homecoming of Beorhtnoth. upon war’s anvil the Welsh smiting. and in olden days this isle conquered. In this poem we have another invasion from an external foe at a much later time, against England and the previous invaders, the Anglo-Saxons: the new invaders are the Vikings, some of whom came to stay. Tolkien was – I would claim – very interested in the idea of English history as a series of invasions: his drafts of The Book of Lost Tales include the idea of the “Seven Invasions of Luthany”. Some of the invaders are listed as: the ‘Rumhoth’, the ‘Ingwaiwar’, and the ‘Forodwaith’, identified as the Romans, the Anglo-Saxons, and the Vikings[xvii]. In The Book of Lost Tales, the “good” invaders who save the Elves and learn their legends are the Anglo-Saxons, and it would be their perspective that would serve as the framework of The Book of Lost Tales. Much later, Tolkien contemplated another “framework”, the story of Númenor, now linked with the legend of Atlantis, and the transmission of the legends of the Elves via collective memory, rather than via the Anglo-Saxon ancestors[xviii]. Was Tolkien – at the time of The Fall of Arthur – contemplating yet another potential framework? The framework of the Arthurian legend? Would Lancelot find Arthur and learn the legends of the Elves in Avallon/Tol Eressea? Was Arthur going to come back, eventually, and save Britain from the waves of invaders that followed? I appreciate that this is pure speculation, but it may be that such an idea possibly entered Tolkien’s mind, if only for a while. After all, this was around the same time he was definitely considering different frameworks for his mythology, associated with the emergence of the Númenor story, which led to his famous note-to-self: “Do the Atlantis story and abandon Eriol-Saga” (brilliantly discussed by Professor Flieger in the first volume of Tolkien Studies). I suppose we can’t ever know what “would-have-been”: but I’d like to emphasise here the strong attraction that Tolkien felt towards the idea of the otherworld over the sea. The significance of the Voyage to an Otherworld island in the West in Tolkien’s mythos cannot be underestimated. It could even be claimed to be central. The example most readers would think of is the departure of the Elves, Gandalf, as well as Bilbo and Frodo, for the Undying Lands at the end of The Lord of the Rings. But Tolkien’s extended mythology abounds with examples of many other characters who make the same voyage overseas – not least Eärendel, whom we mentioned already earlier. And that’s where we can bring in Beowulf. So what is going on here? Is the motif of the voyage across the sea to the Undying Lands so strong in Tolkien’s imagination so as to make Arthur’s sailing to Avalon (perhaps the most iconic representation of such a story) to gravitate towards the more Anglo-Saxon-focused bulk of his mythology? And, if I go back to the hypothesis that Tolkien may have contemplated an “Arthurian framework” for his mythology, is it possible that Tolkien would have made the point that all of those heroes of all of those Northern European legends (Scyld, Arthur, St. Brendan and his company, the Vikings who travelled to Vinland, etc.) were all just misremembered fragments and versions of the same story, Eärendel’s voyage to the Lonely Island? I suppose we’ll never know – unless any further notes or manuscripts emerge. But I think it is significant that there are numerous cross-references to the Arthurian matter throughout Tolkien’s lecture notes on Beowulf. I am just noting a few, among around ten I located. And he also refers to “the ‘Arthurian’ court of Heorot, glorious and doomed, gnawed already by the canker of treachery”[xxiii]. One could argue that Tolkien’s Arthurian references in his Beowulf lecture notes are there for educational purposes: to help his student gain a deeper understanding of the contexts and atmosphere of this Old English poem. After all, everyone knows something about the story of King Arthur – the tale of Beowulf doesn’t have the same resonance for most people. But that may also explain Tolkien’s own fascination with the Arthurian legend, and may point to the reason why he may have contemplated bringing King Arthur’s departure to the heart of his own mythology. If the otherworld voyage was such a powerful stimulation to his imagination, how could he leave Arthur’s Avalon out? Tolkien’s continued to be fascinated with what happened to King Arthur, precariously balanced between both being “mortally wounded” and “carried to Avalon to be healed”, an ambiguous ending that the Welsh tradition supports, a tradition that was bequeathed to Frodo at the end of The Lord of the Rings. This desire for a more ancient, pre-Galfridian, and perhaps more “authentic” medieval source about Arthur’s death (or departure and perhaps possible return) which is only hinted at in The Stanzas of the Graves, remained strong in Tolkien’s imagination. 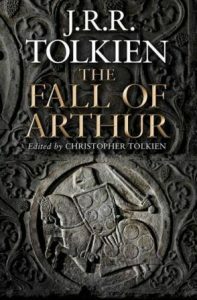 Christopher Tolkien refers to the unfinished status of The Fall of Arthur as “one of the most grievous” of Tolkien’s “many abandonments”[xxvi] but we are lucky to have at the very least the drafts of how Tolkien might have imaginatively rendered the tradition of Arthur’s overseas voyage and how he might have linked it to his own mythology. [i] Tolkien, J.R.R. The Fall of Arthur, edited by Christopher Tolkien. London: HarperCollins, 2013. [ii] Tolkien, J.R.R. 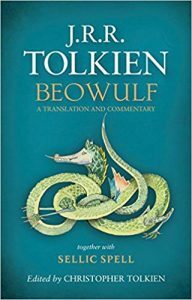 Beowulf: A Translation and Commentary, edited by Christopher Tolkien. London: HarperCollins, 2014. [v] Carpenter, Humphrey. J.R.R. Tolkien: A Biography. London: Allen and Unwin, 1977, pp. 168-9. [x] Geoffrey of Monmouth, The History of the Kings of Britain, transl. by Aaron Thompson, with revisions by J.A. Giles, available at: http://www.yorku.ca/inpar/geoffrey_thompson.pdf, p. 193. [xi] Sims-Williams, Patrick. ‘The Early Welsh Arthurian Poems’, pp. 33-71, in Bromwich, R.. Jarman, A.O.H., and Roberts, B.F. (eds.) The Arthur of the Welsh: The Arthurian Legend in Medieval Welsh Literature. Cardiff: University of Wales Press, 1991, p. 49. [xiii] Morte Arthure: A Critical Edition, edited by Mary Hamel. Garland Medieval Texts, 9. New York and London: Garland, 1984, p. 397. [xvii] Tolkien, J.R.R. The Book of Lost Tales: Part II, edited by Christopher Tolkien. London: HarperCollins, 1984, pp. 294 and 323. [xviii] See ‘The Lost Road’ in Tolkien, J.R.R. The Lost Road and Other Writings, edited by Christopher Tolkien. London: HarperCollins, 1987. [xxi] See in Tolkien, J.R.R. Sauron Defeated, edited by Christopher Tolkien. London: HarperCollins, 1992.